Eye: Deep dark reddish amber. Nose: Pastry cream and toasted cookie dough. Grainy, and warm. Palate: Rich fruit cake, and a saltiness that perfectly balances the fruits of the orchard. A long finish, with citrus, orange notes. 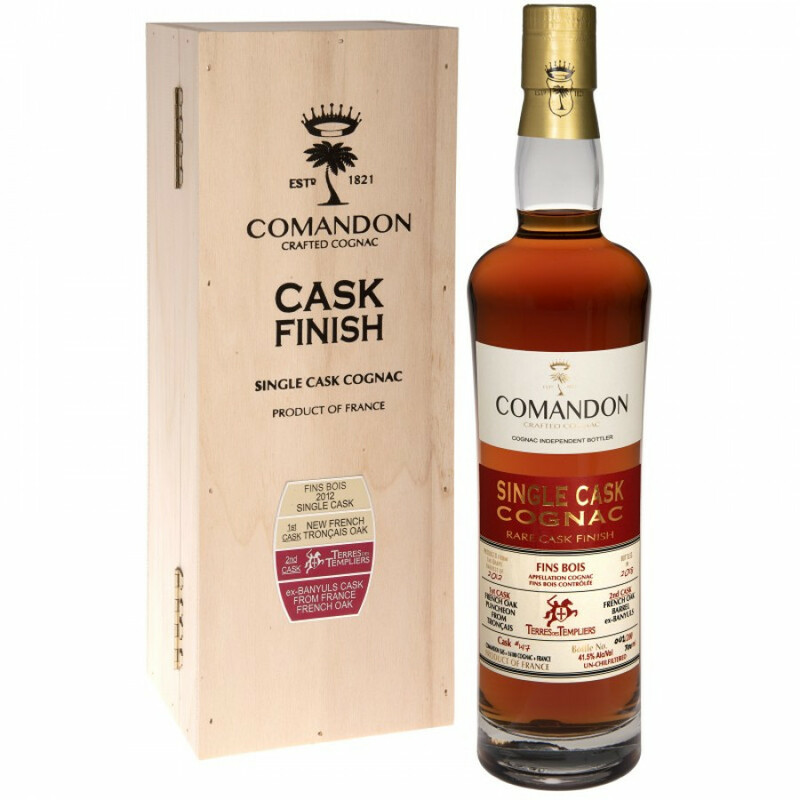 The iconic independent Cognac brand Comandon have completed their first ever experiment with the cask finish of an ex-wine finish Cognac. The Comandon Rare Cask Finish in Ex-Banyuls is the result of a fine collaboration with Terres des Templiers, the oldest vineyard and winemaker in the whole of France. This is therefore an exciting addition to their single cask collection, and is a wonderful Vintage dating back to 2012. For this particular Cognac, Comandon have chosen eaux-de-vie from the largest cru in the Cognac region, the Fins Bois. This cru is generally characterized by its environment that ages quickly, its proximity to a maritime climate and the fact that it circles three other crus. Ex-Banyuls single barrels have been selected from the prestigious vineyard that dates back nearly three millennia, and so it is truly precious. The famous terraced vineyard of Terres des Templiers is found, in Banyuls-sur Mer off the coast of France. Quite literally nestled between mountains, sun and sea, it is a spectacular place for aging wines, and its barrels are special indeed. A collaboration with Comandon underlines the collaborative and experimental nature of this Cognac house. This is an exciting point in Cognac history. Founded in 1821, the Maison Comandon is in Cognac and is thought to be the oldest house in the whole of the Old Town, and is considered to be the first place which started Cognac production. The foundations of the house date back to 418 BC, during Roman rule. It therefore has a large reputation to uphold, and does so wonderfully. As an independent, small-batch brand, the Cognac selection normally functions with a “once it’s gone, it’s gone” mentality. What better way to savor each aroma and note of this finely aged Cognac than enjoying it neat? You will taste all of its maritime history with each sip.